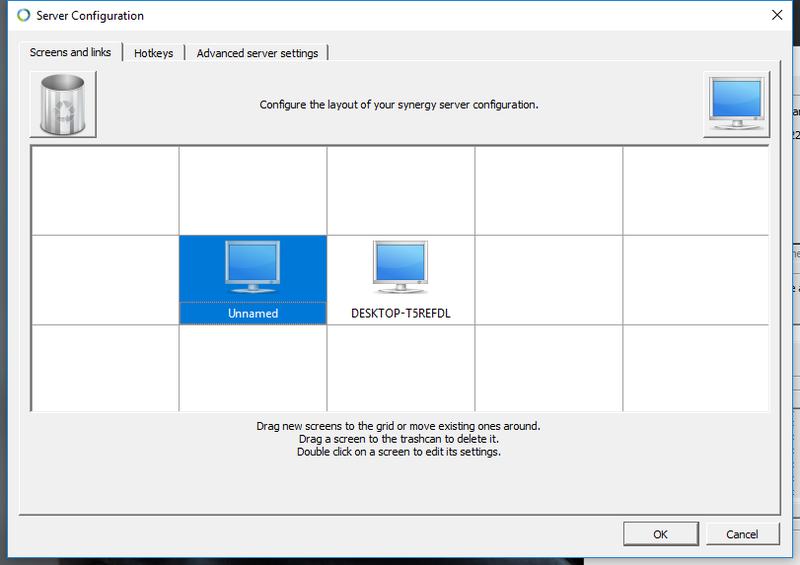 My windows machine is running the server side fine, but there are no additional monitors appearing the Server Config. window, so there is nothing to add in for sharing. You should see this under the grid when you open the server configuration interface. That's because the server can't identify your client's screen name since you haven't changed the screen name on that unnamed screen. Please check Getting started with Synergy knowledge base article for steps on how to do an initial configuration. Here are screenshots attached as ref. What am i doing wrong here? Please make sure that both machines has their SSL switched on if you want them to connect with SSL. You can switch them both off if you want them not to use SSL. Make sure that before you switch SSL settings, both machine's Synergy is not running/not started. 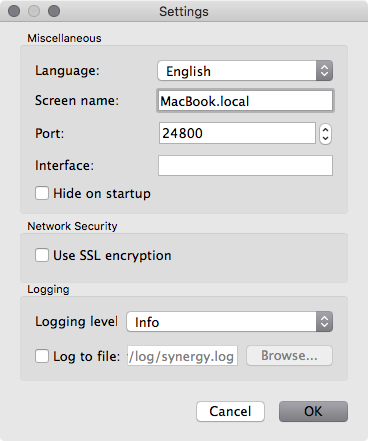 After switching SSL off on both, restart Synergy one each by closing and re-opening it. How about the logs on the server? Please post a screenshot of both machine's Synergy interface and the Server Configuration interface on your server machine again. Hi @jammermass. It shows there that your server now has 192.168.0.3. This happens when your server machine's IP lease expires. The DHCP server (mostly your router) will then provide your computer a different set of IP address. If you'd want to have the same IP address every time, you might need to set DHCP reservation on your router's user interface. For now, you can just set the Server IP on your mac with that 0.3 address as shown on your server machine. You're welcome @jammermass. Thanks for the update too.